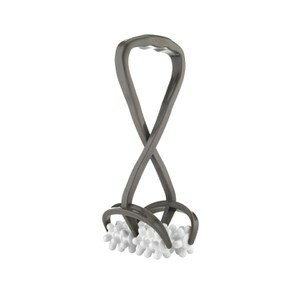 Sarah Chapman Skinesis Bodylift is a unique massaging tool that mimics the fast-tapping, pinching and knuckling techniques of the brand's Skinesis massage. Designed with 12 wheels and 72 nodules that roll deeply over the skin to refine, tone and firm, whilst stimulating blood circulation for a healthy-looking glow. Suitable for use on all skin types, the revolutionary tool relieves aching muscles and supports lymphatic drainage to break down fatty deposits on the upper arms, thighs, buttocks and calves. With regular use, you can experience tighter, defined and smoother skin with an improved appearance. E.N. Please Note: Not to be used on the face and neck. Not to be used by children. If any problems arise, please consult your doctor.